As the balmy summer weather wanes, the cooler season approaches, leading many homeowners to consider switching on their heating system. Misfiring furnaces are often a prime suspect in cases of puffback. What is a furnace puffback? When a furnace misfires, it releases a puff of black, grimy soot or blackened smoke. Unburned oils and gases build up inside the furnace combustion chamber as a result of a furnace failing to ignite correctly. Once the furnace finally ignites, this combination of oil and gas vapors explodes, causing the dangerous phenomenon known as a furnace puffback. 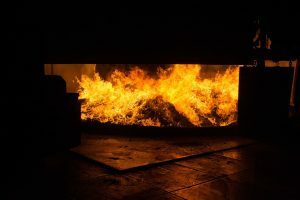 Oil furnaces are more inclined to undergo puffback situations, since oil has the tendency to accumulate rather than disperse (like gas); however, gas furnaces are also vulnerable to puffback explosions. Oil furnaces also produce significantly more soot than gas furnaces, leading to sticky, unsightly black residue requiring professional cleanup. What are warning signs of a potential puffback? In order to properly clean up a puffback mess, it is important that homeowners are able to identify a puffback situation. Lingering odors of gas or soot can indicate a puffback is about to occur. Charred soot particles along the ceilings or walls or on top of the furnace signal that the furnace requires immediate attention. When the furnace is not in operation and oil drips or leaks, a homeowner should promptly contact a heating technician to address the leak. Oil can leak into the combustion chamber of the furnace when the oil burner does not shut down correctly. A lack of maintenance to the oil burner also is likely to result in unburned oil and a subsequent puffback incident. How do you identify puffback scenarios? In order to properly clean up a puffback mess, it is important that homeowners are able to identify a puffback situation. A loud sound may erupt once the explosion occurs. Smoke may emerge from the vents. Residue from a puffback explosion has a petroleum base. The black, oily film adheres to every surrounding surface, including furniture, fabrics, clothing and any exposed goods. The sheer force of the explosion can blow the soot particles underneath doors and into closed spaces, like drawers. Puffbacks can also meander through the home’s ductwork and infiltrate every inch of the home. Why are puffbacks so difficult to clean? A homeowner who sees the results of a puffback will have a chaotic scene to clean up. The soot emitted from furnaces is incredibly sticky, black and oily. The residue may impact the entire home. In extreme situations, homeowners may evacuate their property for a period until the puffback mess is cleaned up by fire and smoke damage restoration pros. How do homeowners tackle a puffback cleanup? While experts advise puffback cleanup should be handled by restoration professionals, homeowners have basic recourse when a puffback occurs. Assess how much damage was done to the goods inside the home, including furniture and the clothing inside closets. Document the ruin with photographs, video and notes for insurance purposes. Dress for the cleanup. A homeowner should wear protective personal equipment when attempting to clean a puffback scenario. Respirators should be worn as a precautionary measure. Apply a smoke odor counteractant with a pump sprayer to all horizontal surfaces. The duct system should also receive treatment with the odor counteractant. Prior to turning on the heating system, release soot particles from the duct with duct cleaning equipment. Using a rag, wipe down all the surfaces with a highly concentrated degreaser. Experts advise against using dry cleaning sponges to wipe away grime, as these types of sponges can push the oily soot particles deeper into the surfaces. Once the affected surfaces are cleaned, apply a sealant and repaint. Homeowners should replace the air filter and cover the vents with layers of cheesecloth to prevent the release of soot. What are the dangers of cleaning puffbacks yourself? The oily soot from puffbacks should be neutralized. Scrubbing the black, sticky residue away can lead to damage to the drywall, carpeting and other surfaces upon which the soot has settled. Special chemical treatments are required to safely remove the residue from surfaces without destroying the goods in the process. Plus, soot residue can be dangerous. Homeowners are advised to reduce exposure to the particles by calling in a professional. How do you prevent furnace puffbacks? Routine furnace maintenance is the best way to prevent a buildup of black soot inside the combustion chamber and the consequent puffbacks. In the event the soot accumulates to over half an inch each year inside the furnace, a professional should be called in annually or biannually to remove the combustible material. A buildup of soot inside the combustion chamber has several drawbacks: reduced heating efficiency, increased energy bills and a risk for a fire within the chamber. Puffback cleanup should be handled by fire and smoke damage restoration professionals, such as ServiceMaster Restoration by Complete. As a homeowner, you’ll want to protect both the occupants in the home as well as the property itself from further damage caused by the fine soot particles unleashed through a furnace puffback event. ServiceMaster Restoration by Complete technicians recognize the dangers of puffback residue and arrive onsite within one to two hours of your call. Advanced cleaning methods and chemical cleaners are utilized to safely remove all residue without damaging delicate surfaces, such as marble, chrome, brass, upholstery, carpeting and porcelain. The company’s team addresses the most fragile items first as a part of the restoration process. Our trained specialists at ServiceMaster Restoration by Complete restore all affected ceilings, walls and flooring. We will also deodorize the entire space to ensure the home is safely and comfortably habitable once again. Damages caused by the sooty residue of puffbacks require immediate attention. The fine particles of soot have a tendency to spread, leading to extensive damage, like etching and tarnishing, if not addressed promptly. ServiceMaster Restoration by Complete reliably serves the residential and business communities of Staten Island, NY. 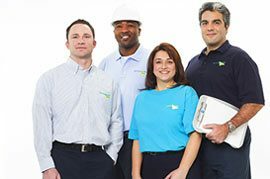 When puffback cleaning is required in a home or commercial property, immediately contact ServiceMaster Restoration by Complete for emergency service.